On Wednesday night I gave a short talk to the Over Gardening Club about my (varied) work, and this inevitably turned to a discussion about bird ringing. It looks like there is a lot of interest from villagers about this, and I will be sending out fliers to everyone in the village to ask if you have nest boxes in your garden that I could monitor throughout ther summer. I'd also be interested in hearing of any open-nests you find (i.e. 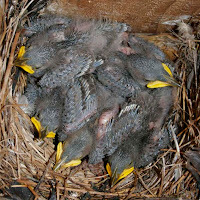 nests that aren't in boxes), as these provide very valuable data too. These might include species such as blackbird, song thrush, robin, dunnock, swallow, meadow pipit, skylark, linnet, whitethroat, and many more, so once the breeding season starts in March, keep your eyes (and ears) open!